Teeth can come loose and eventually be lost due to a number of causes, including decay, gum disease, injury, or advanced wear over time. 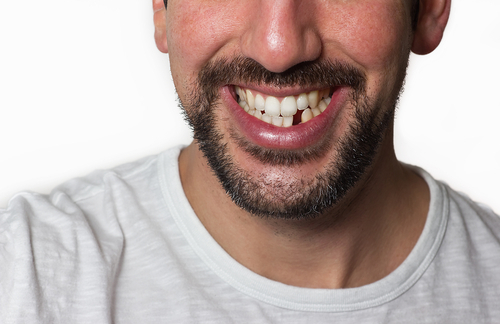 While a missing tooth may initially only seem like an aesthetic concern, there are a number of hidden problems that can occur over time if the missing tooth isn’t replaced. The remaining teeth begin to shift. If a lost tooth is not replaced, this can cause the adjacent teeth to move into the space since there isn’t support to keep them in position. Bone starts to be resorbed. When a tooth is missing, there is no longer a root to stimulate the jawbone. This leads to bone recession and a decrease in bone mass. Gum tissue gradually recedes. As the bone deteriorates, the gum tissue will also begin to recede since there isn’t a structure for support. The lower portion of the face may change in shape. This is caused by missing or slowly deteriorating oral structures that previously contributed to the full cheek appearance. The face may look prematurely aged. Between tooth loss and the teeth gradually wearing down, the distance between the nose and chin may begin to decrease leading to wrinkles and an older facial appearance. Since a variety of issues can present themselves when a tooth is not replaced, Dr. Andrew Skasko offers multiple treatment options for patients to choose from—from bridges and conventional dentures to dental implants and implant-supported dentures. Dr. Skasko will meet with you to perform an oral examination and discuss what you hope to achieve with your tooth replacement. In many cases, dental implant-based solutions are recommended if the patient proves to be a good candidate. This is because implants are the most lifelike replacement for a missing tooth and are the only solution that can help prevent bone resorption. For more information about the tooth replacement options available at Elite Dental, please contact us to schedule your appointment with Dr. Skasko.